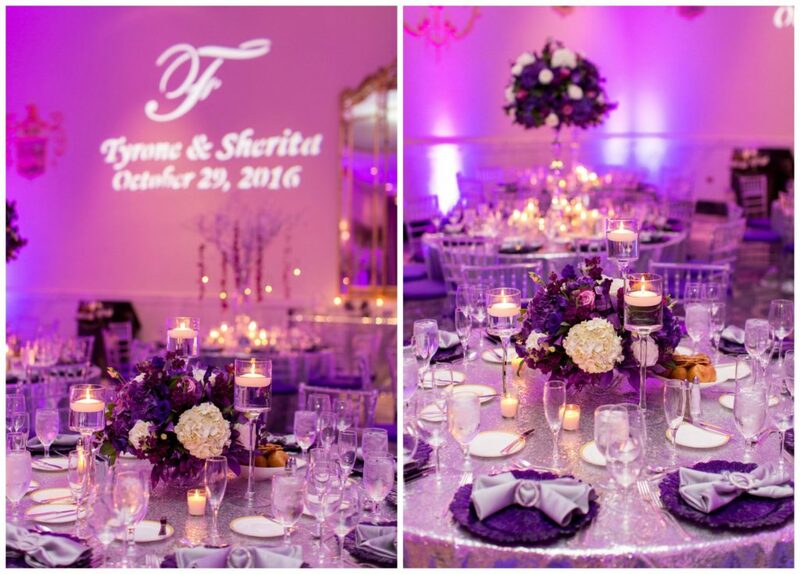 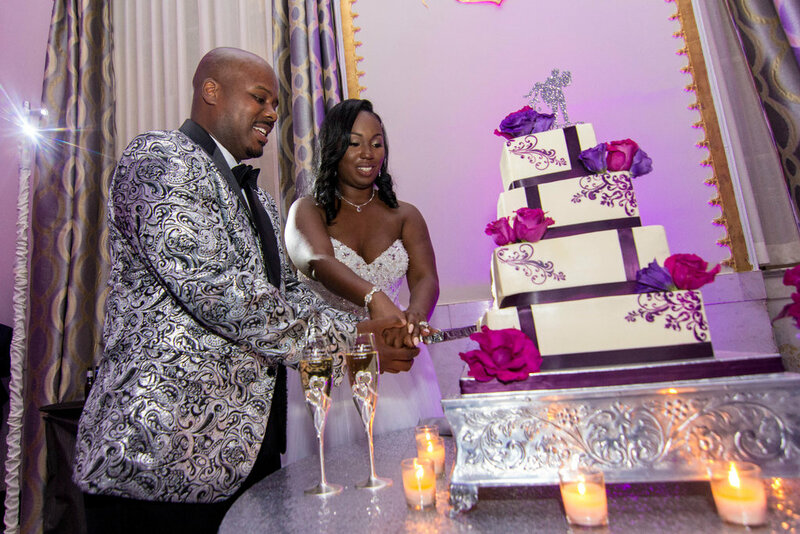 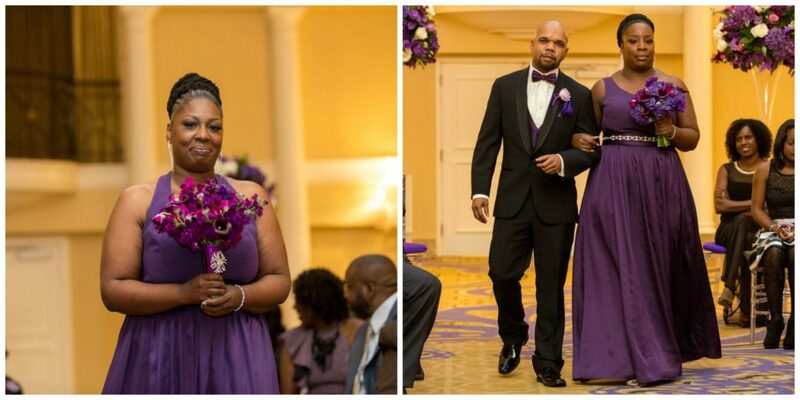 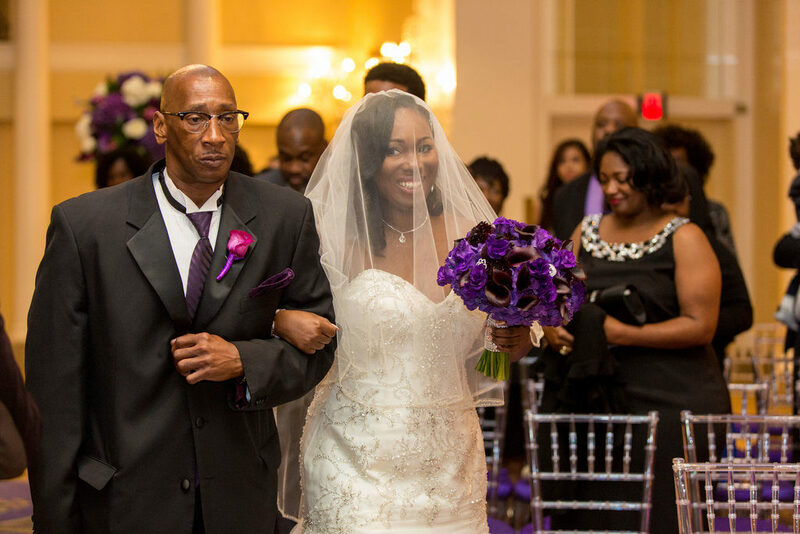 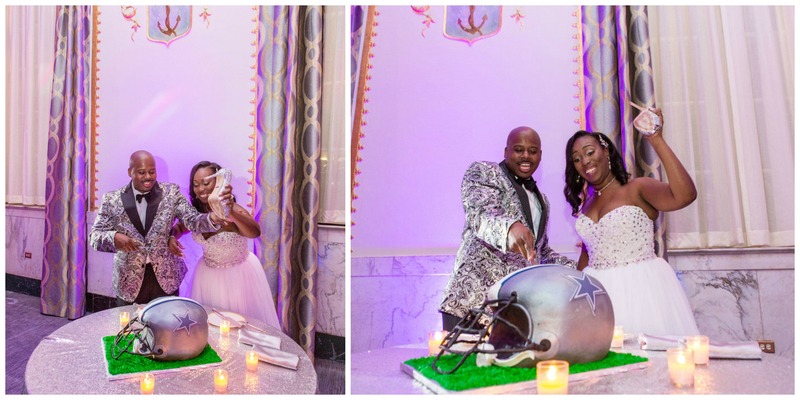 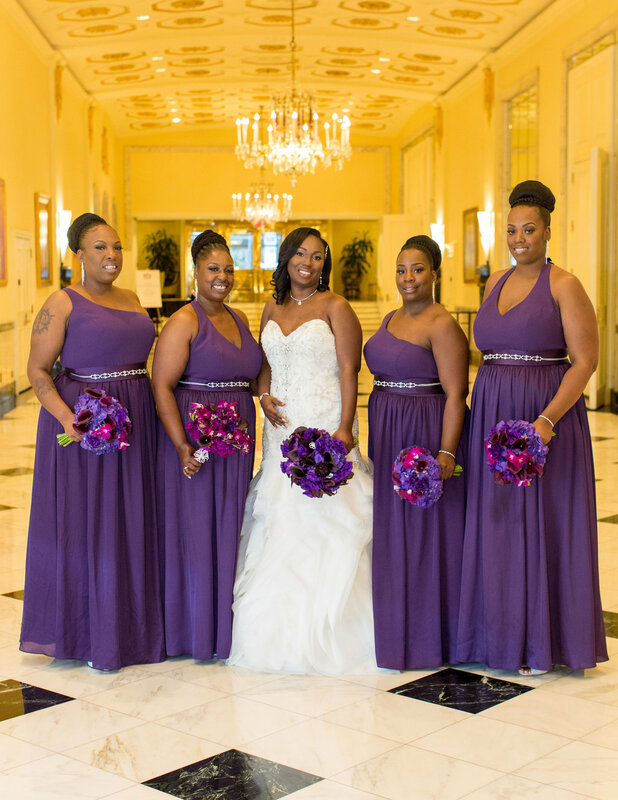 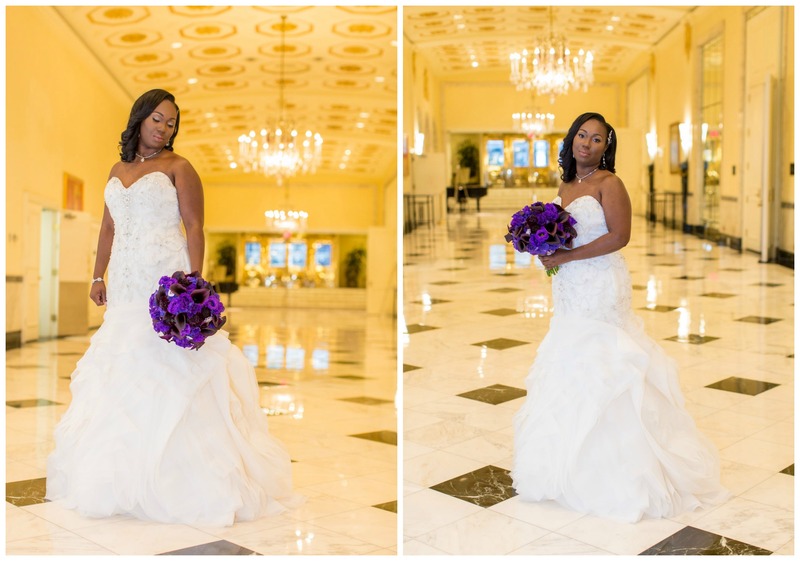 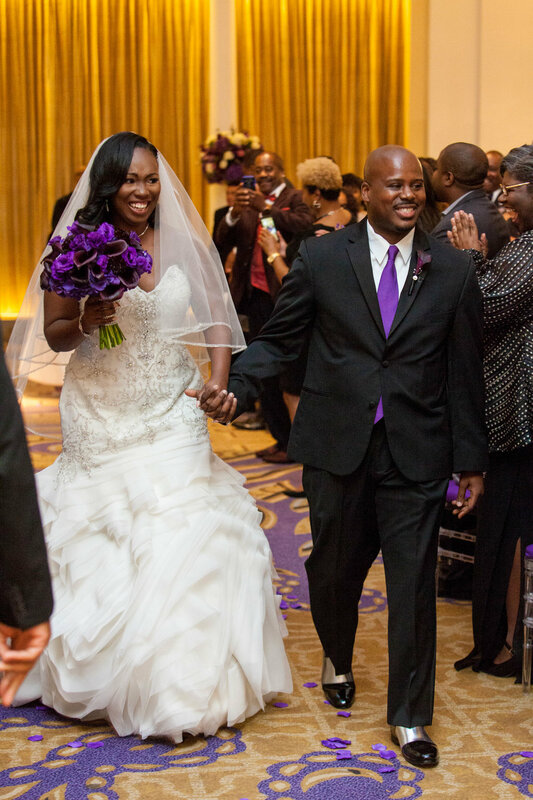 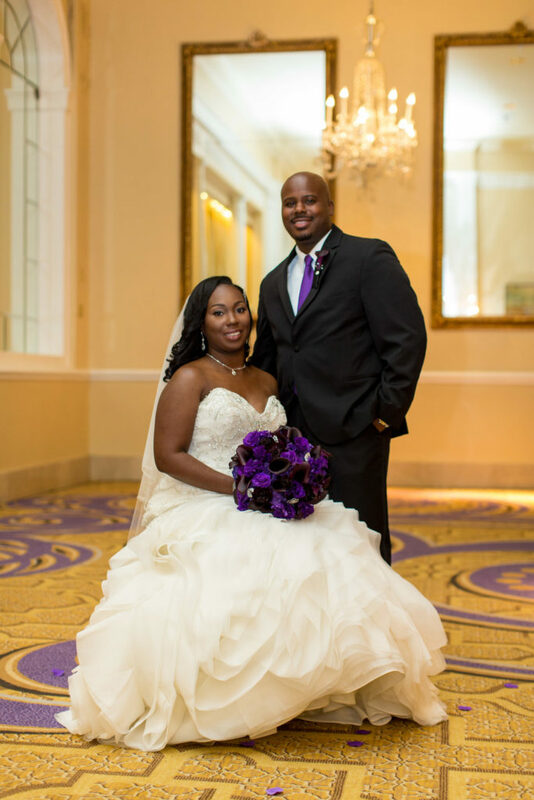 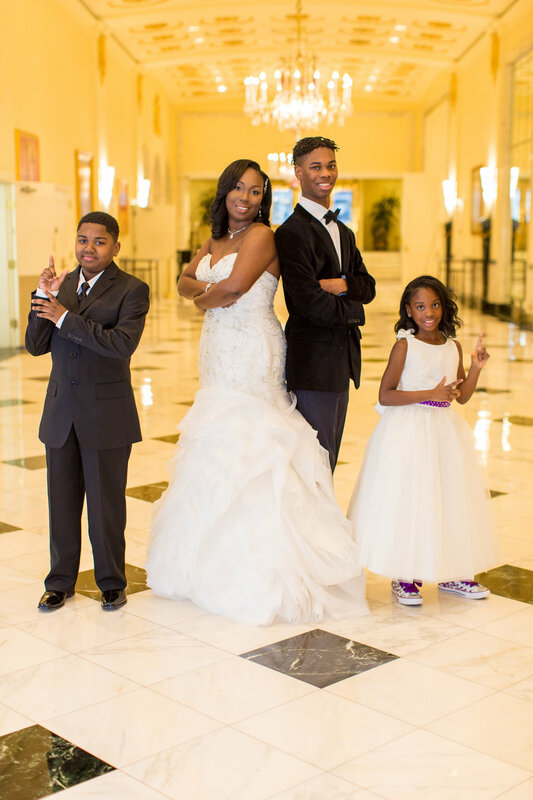 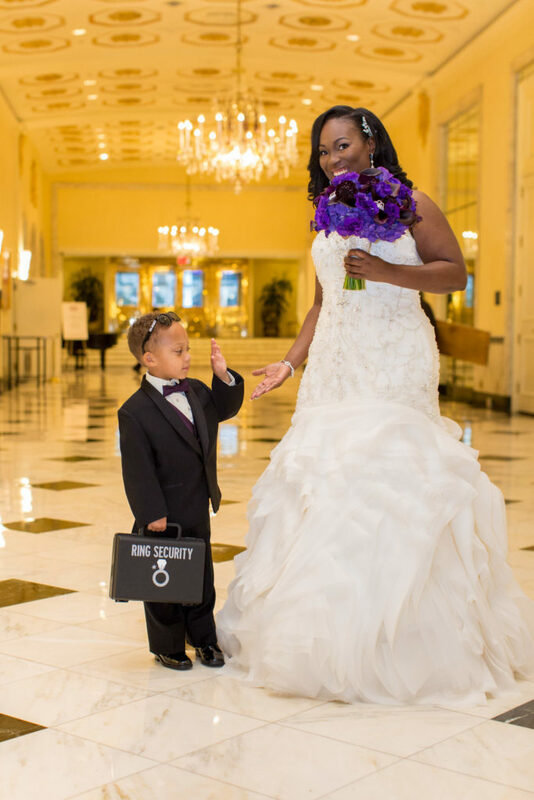 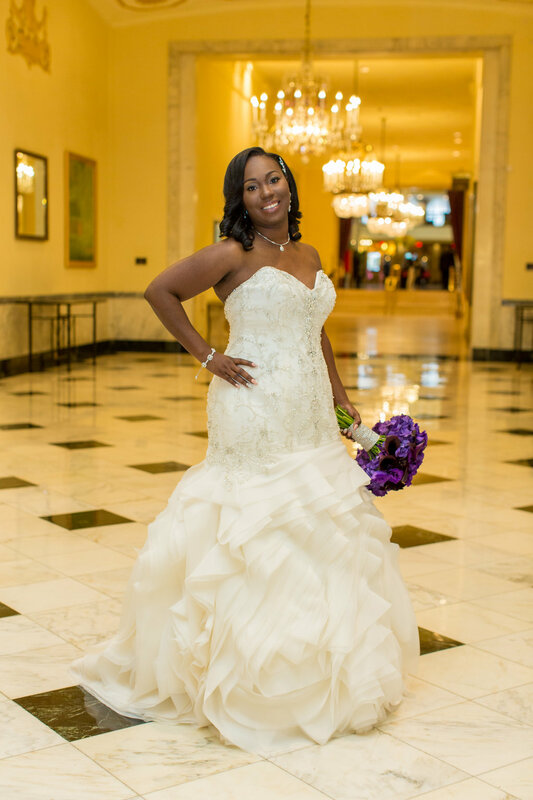 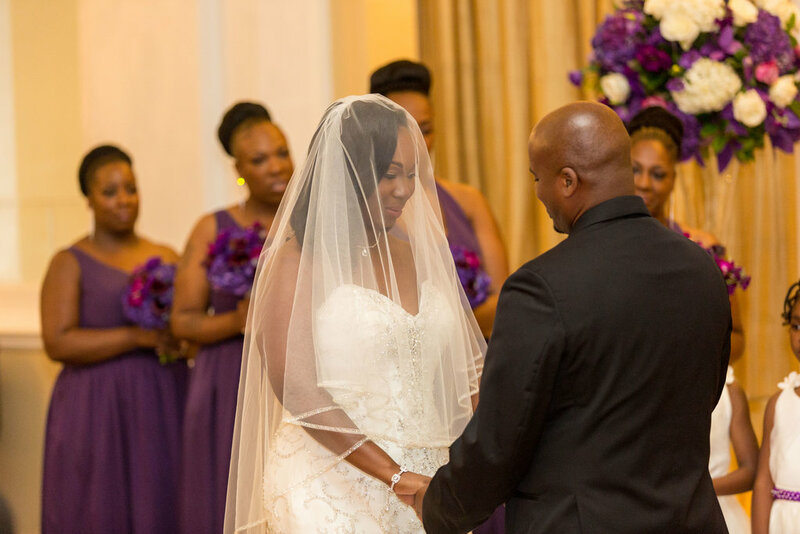 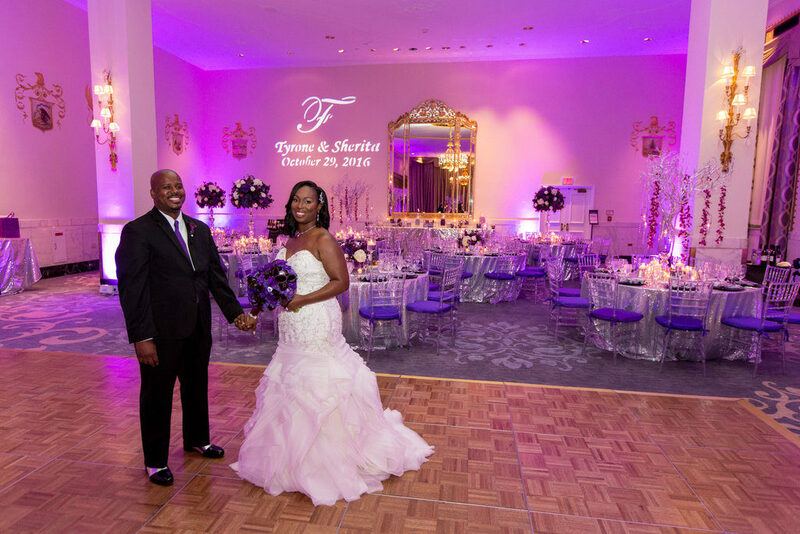 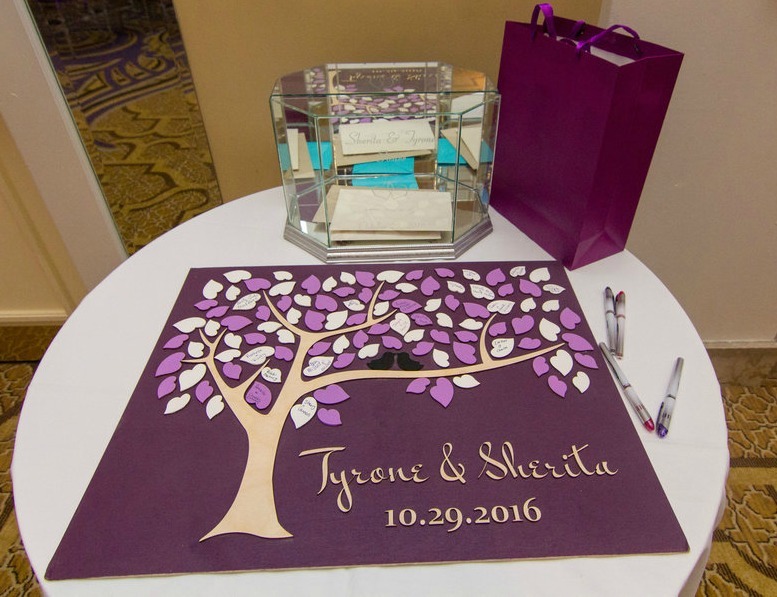 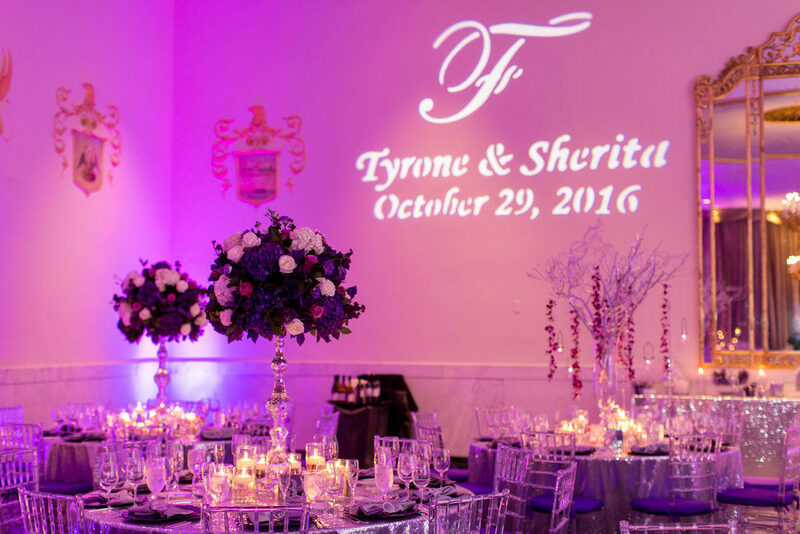 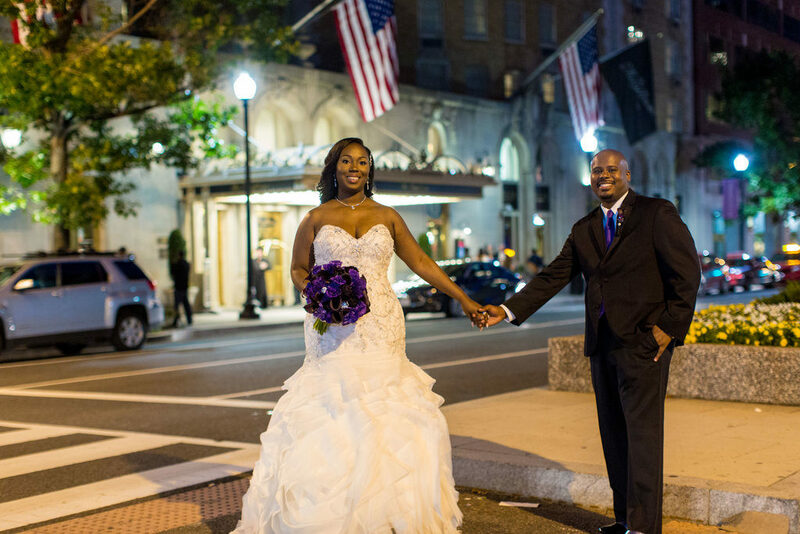 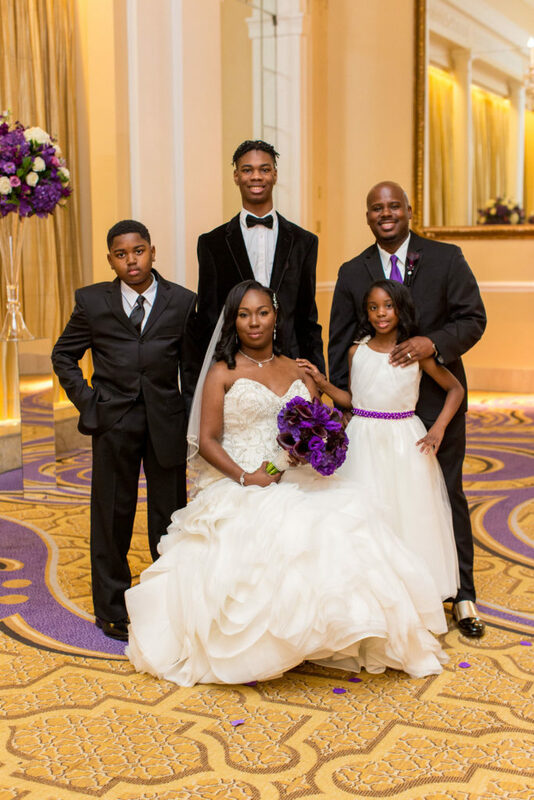 Sherita and Tyrone got engaged on June 7, 2015 and tied the knot in a glam purple and silver wedding on a beautiful fall day last year. 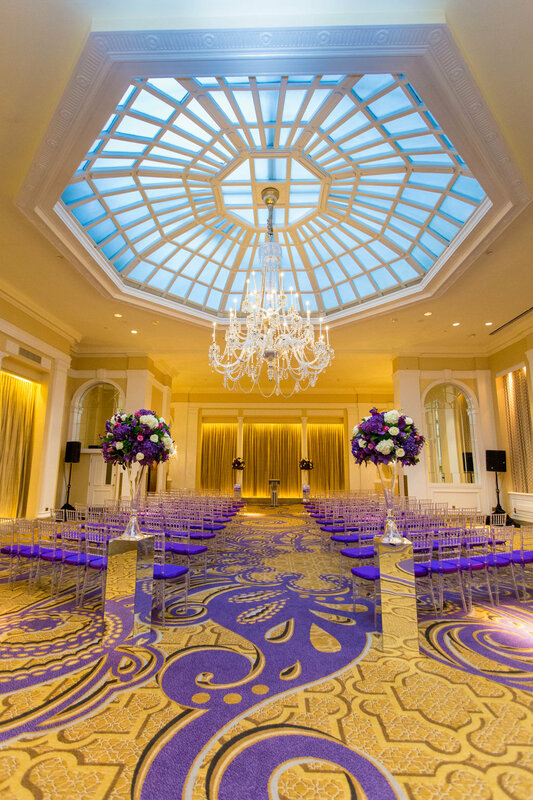 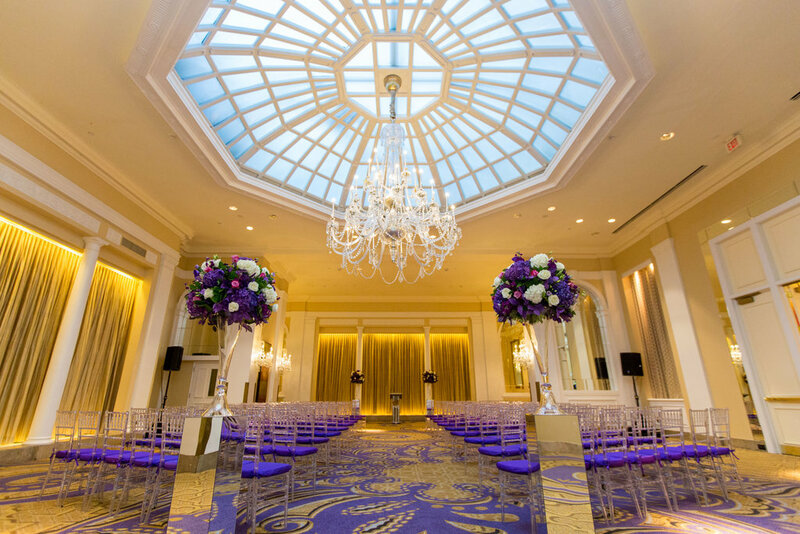 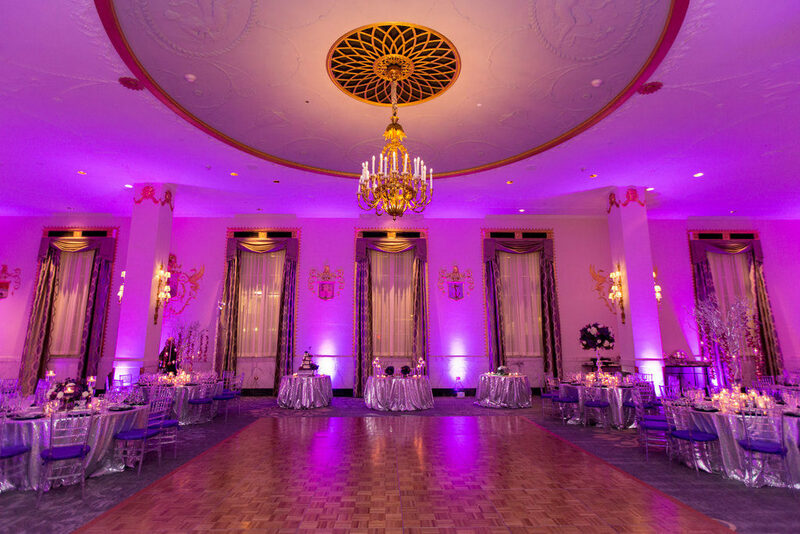 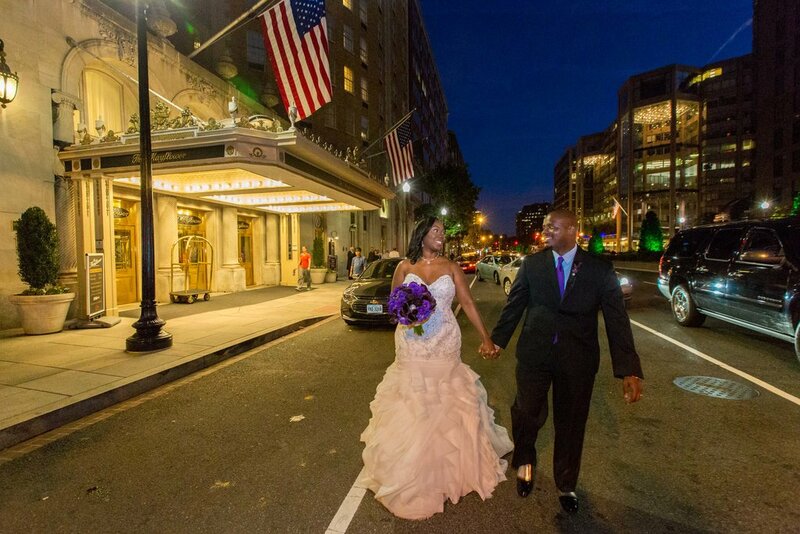 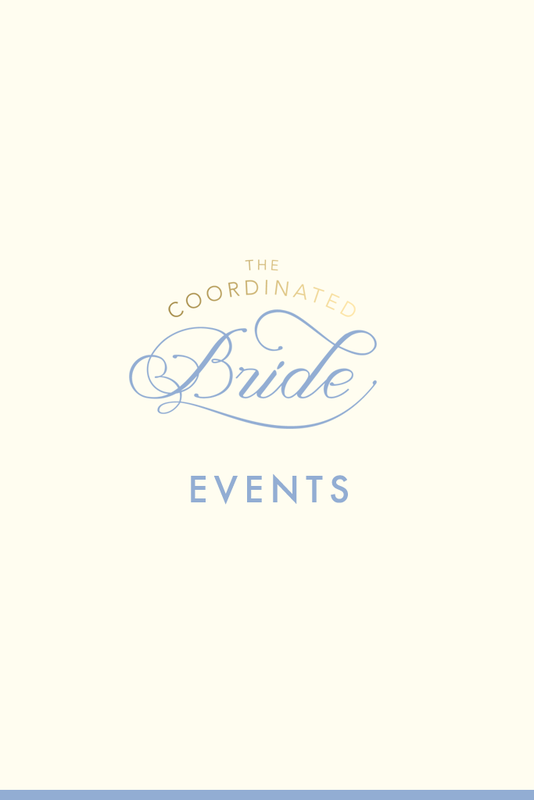 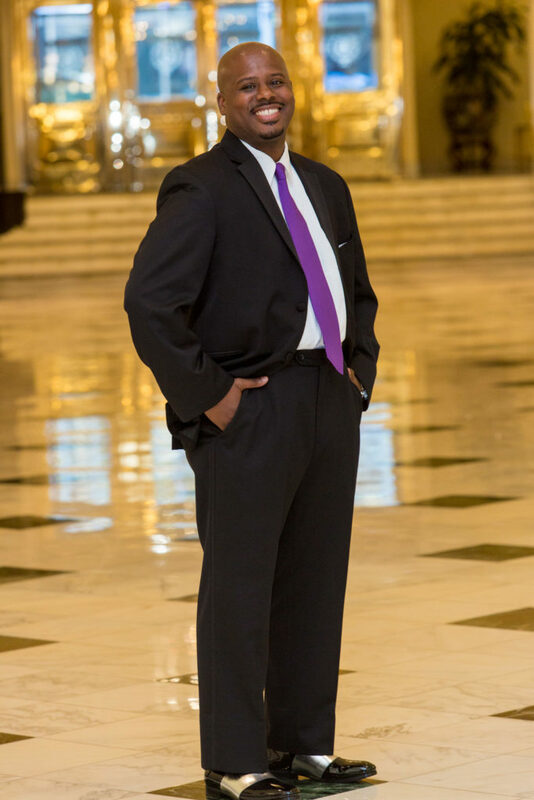 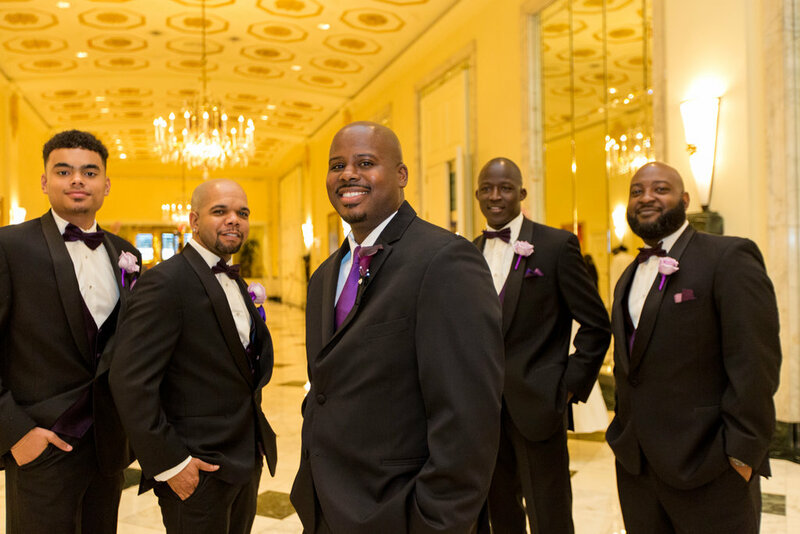 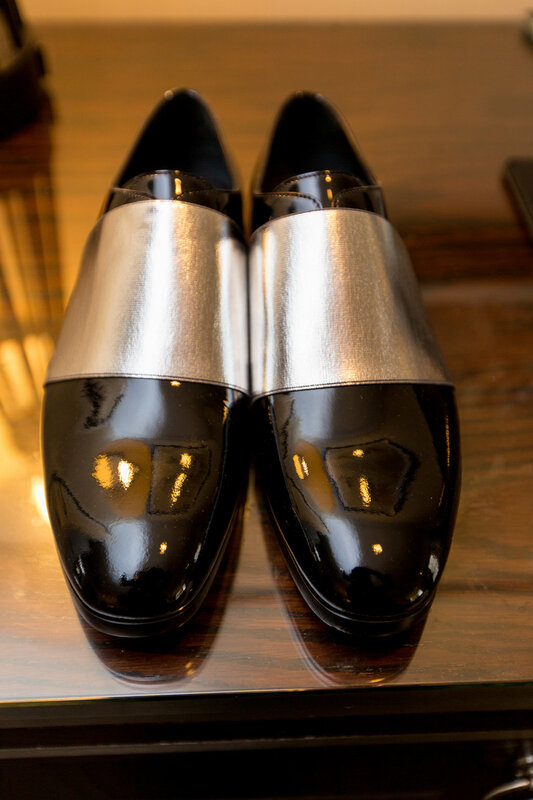 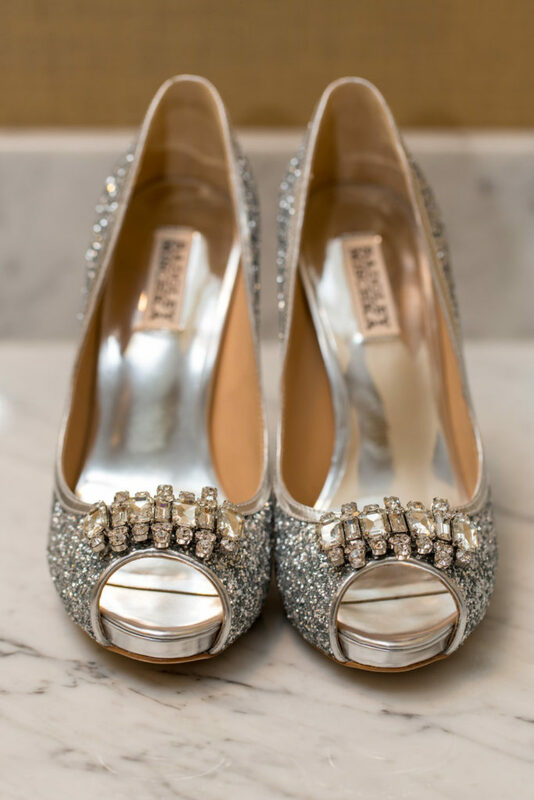 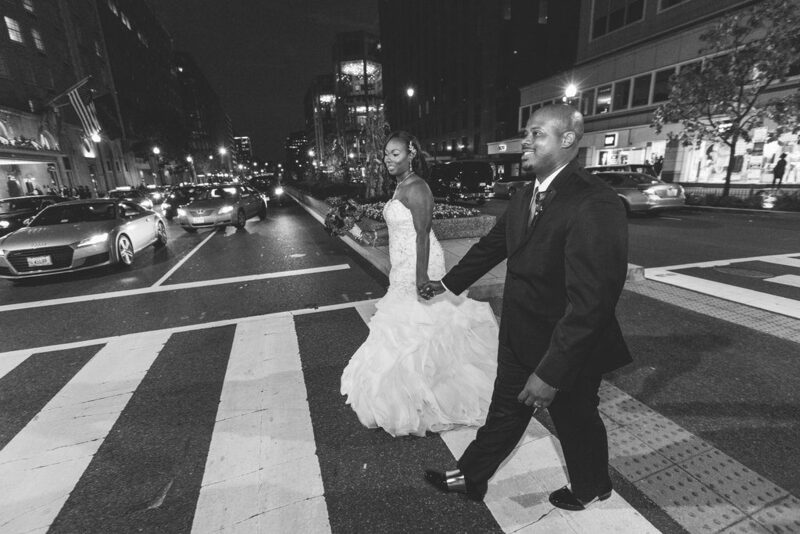 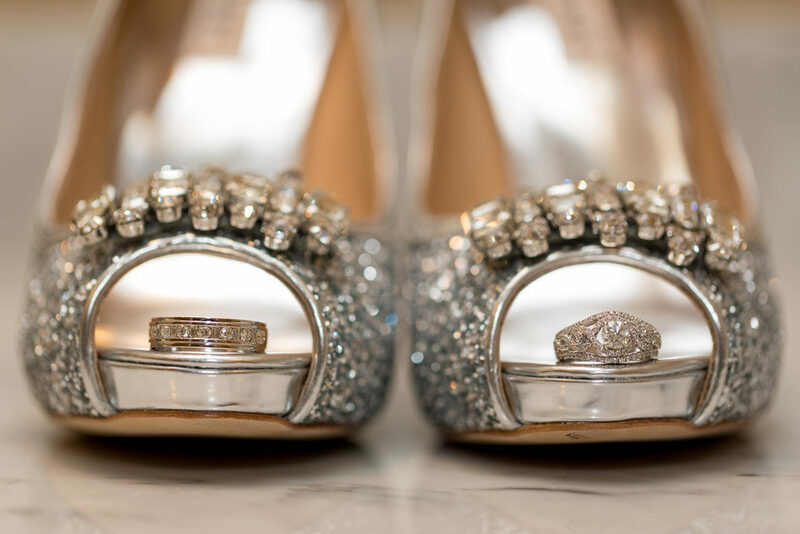 The venue of choice was The Mayflower Hotel in Washington, DC. 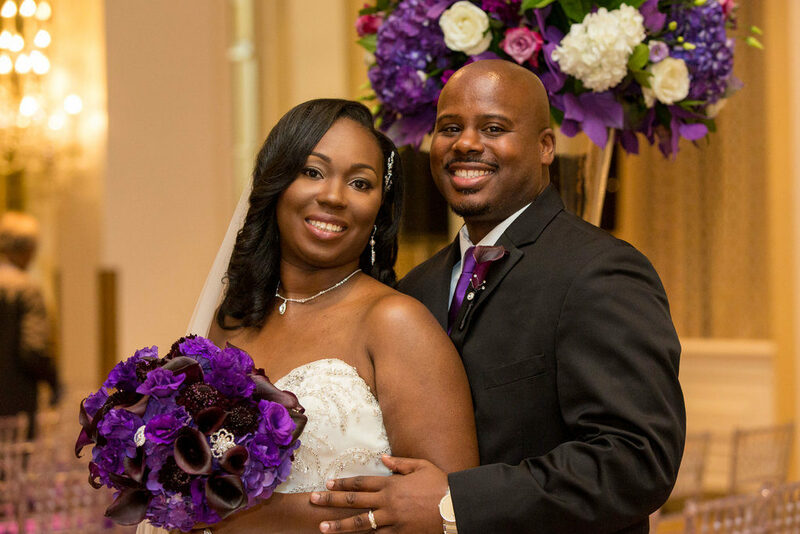 The couple met over 8 years ago on a dating website. 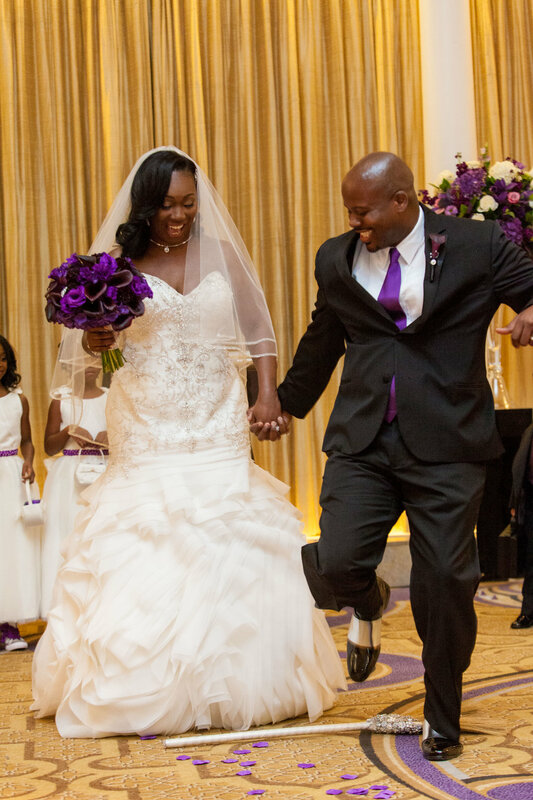 During their exciting courtship, Sherita was diagnosed with Cancer (now she is a Cancer survivor), and she stated Tyrone jumped right in and didn’t walk away from her – he stood by her side every step of the way. 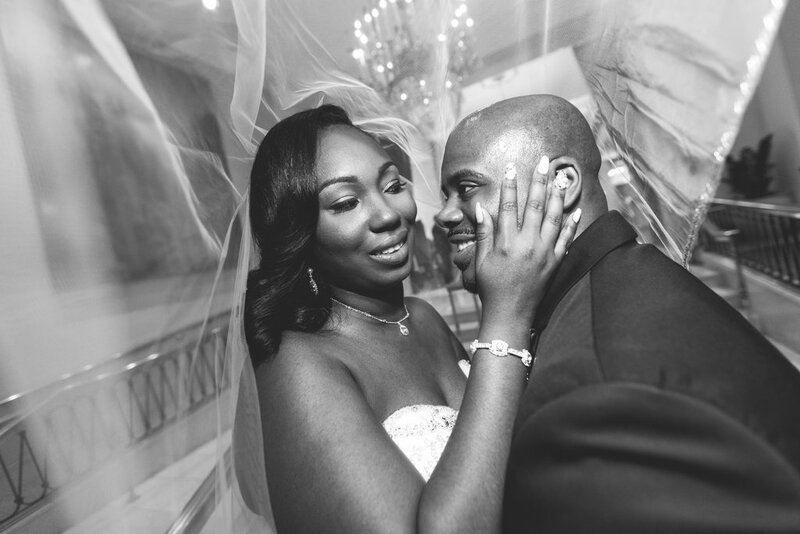 From that moment she knew that he was the one for her. 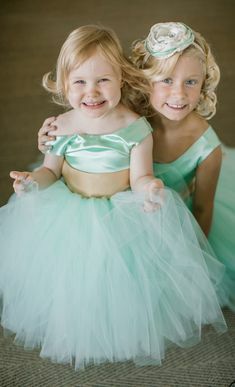 During their courtship they had a daughter named Maddie, who is the apple of Tyrone’s eye; the two of them are inseparable which you could tell by their interaction during the planning process of the wedding. 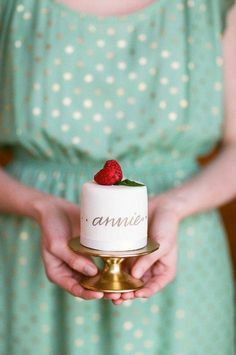 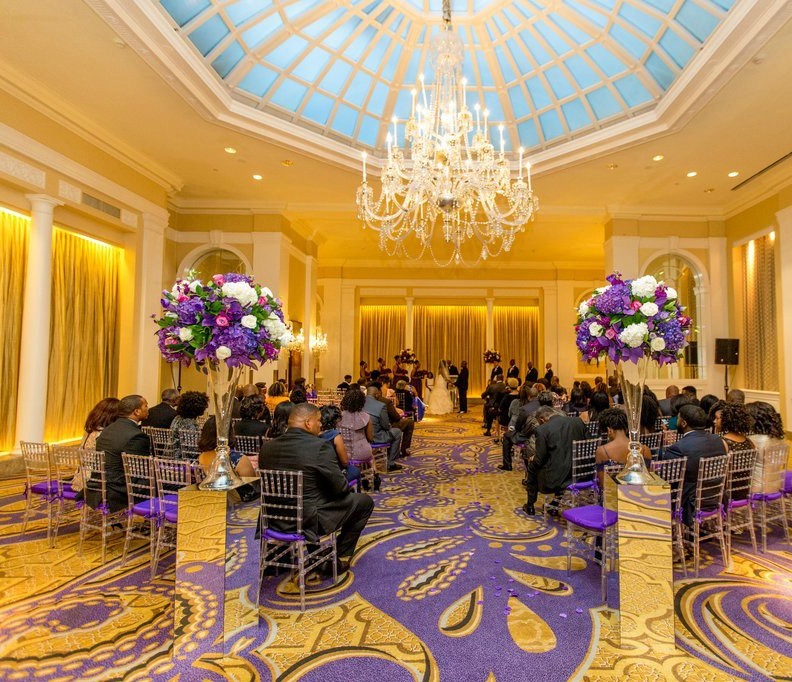 The wedding including an old African American tradition called “Jumping the Broom.” This tradition has carried on since 1897 in West Africa/Ghana. 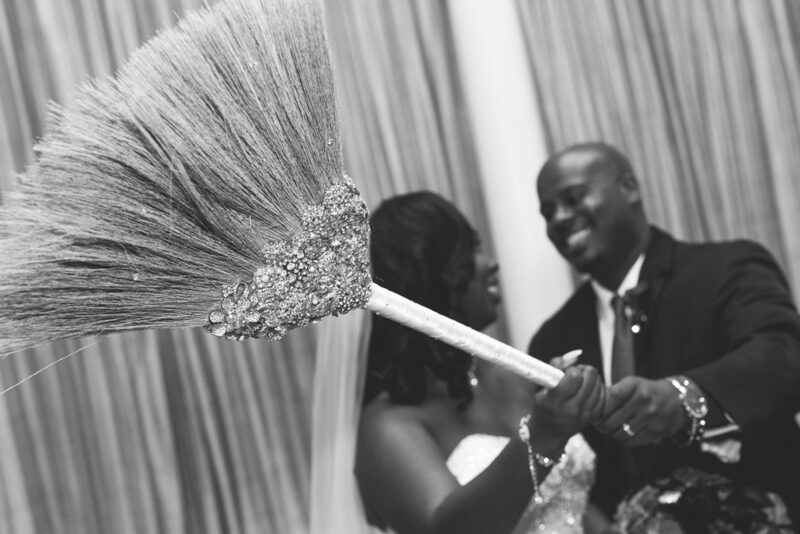 The jumping of the broom has several meanings across African cultures. 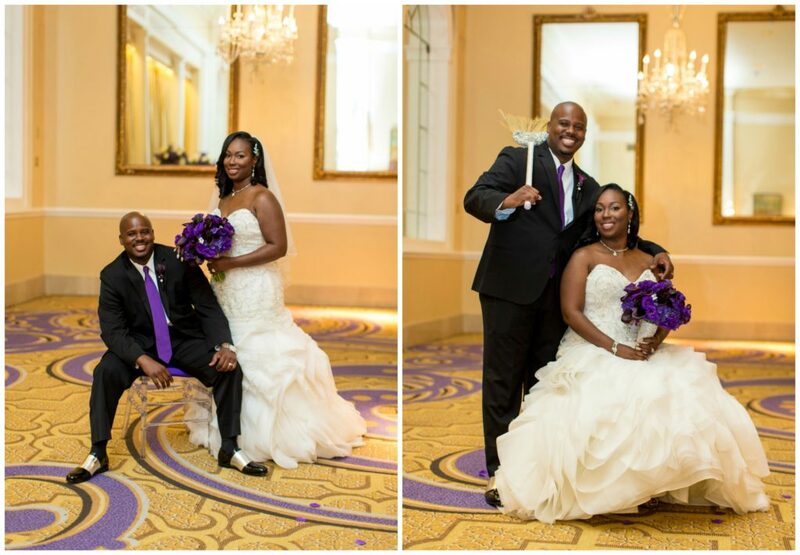 However, the broom represents to all, a spiritual value of warding off evil spirits and past wrongs; and sweeping away the old and bringing in the new. 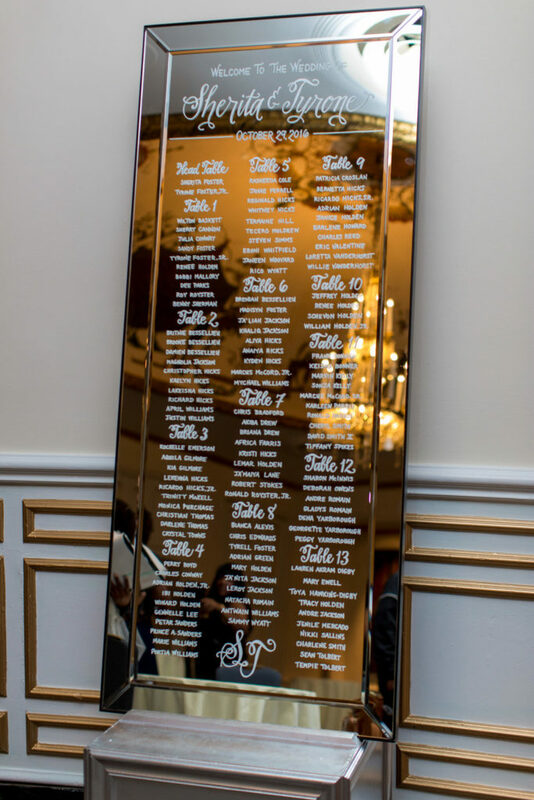 And for the humor in it all, it says the person that jumps the highest will be the ruler in the household. 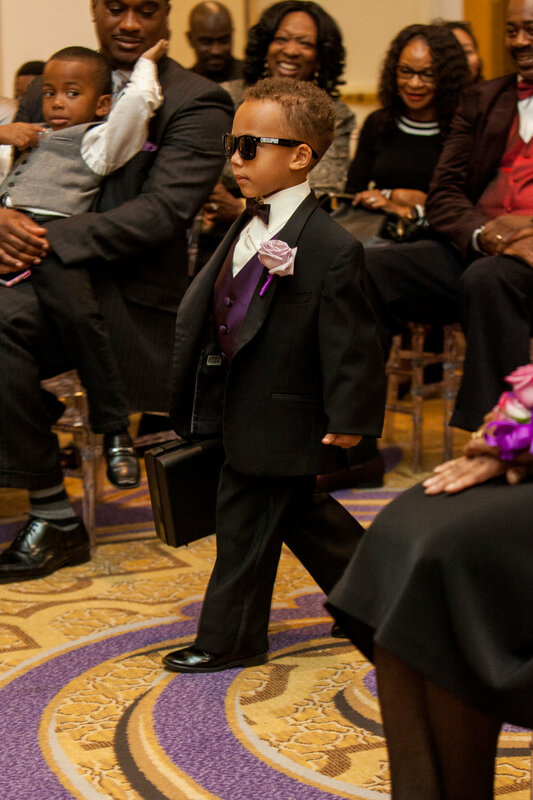 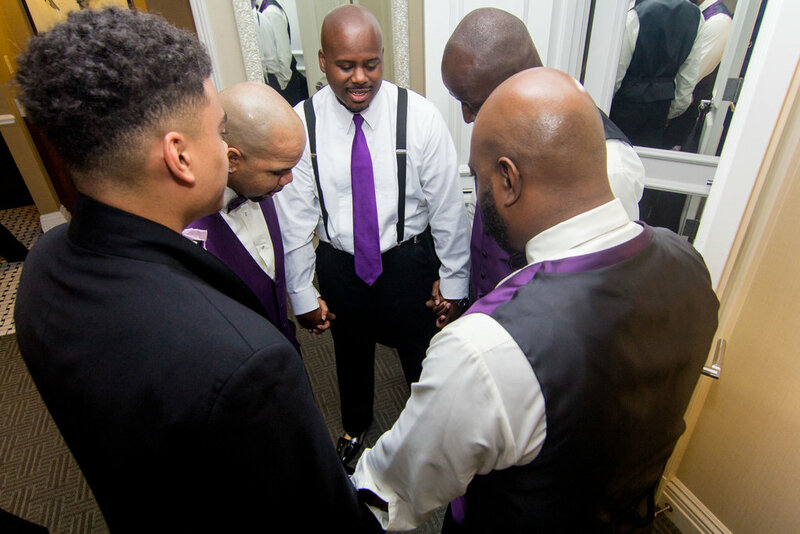 There were also numerous special and personable moments throughout the wedding day. 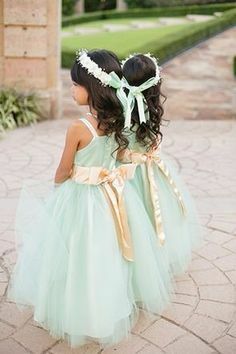 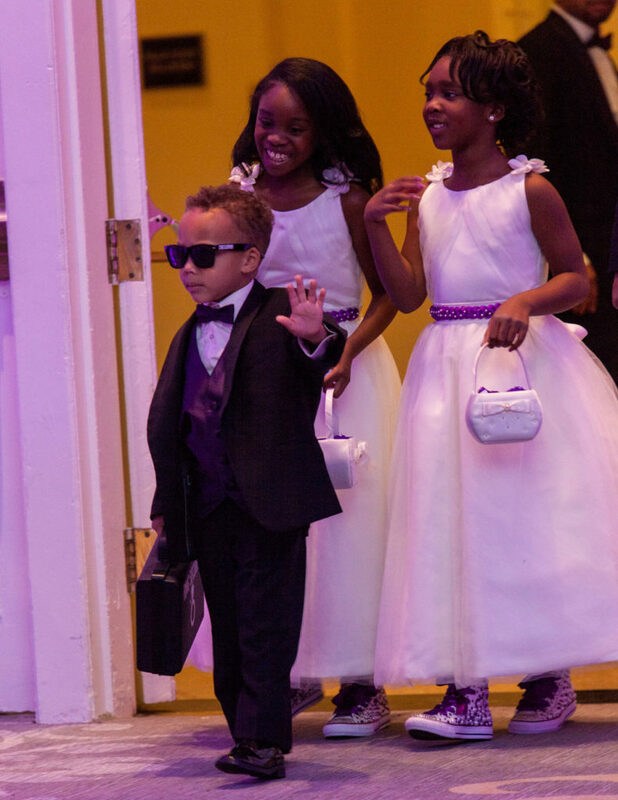 The flower girl wore blinged out high-top converse sneakers. 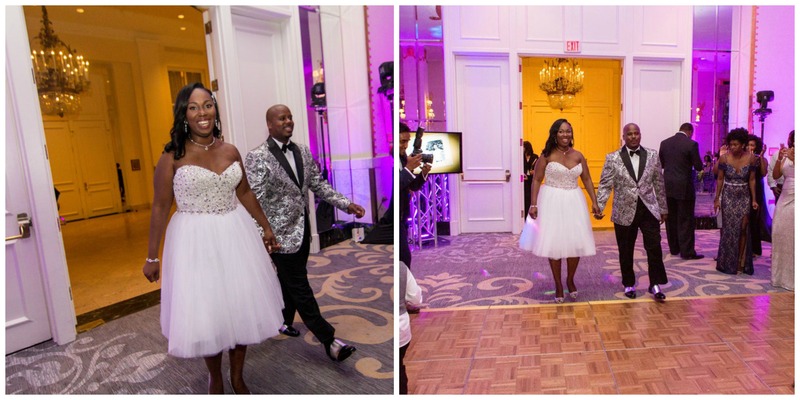 Both the bride and the groom did an outfit change between the ceremony and the reception. 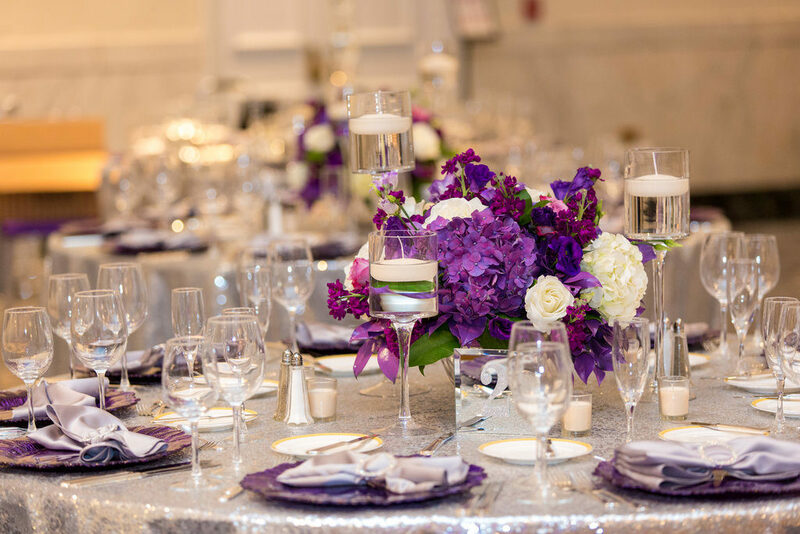 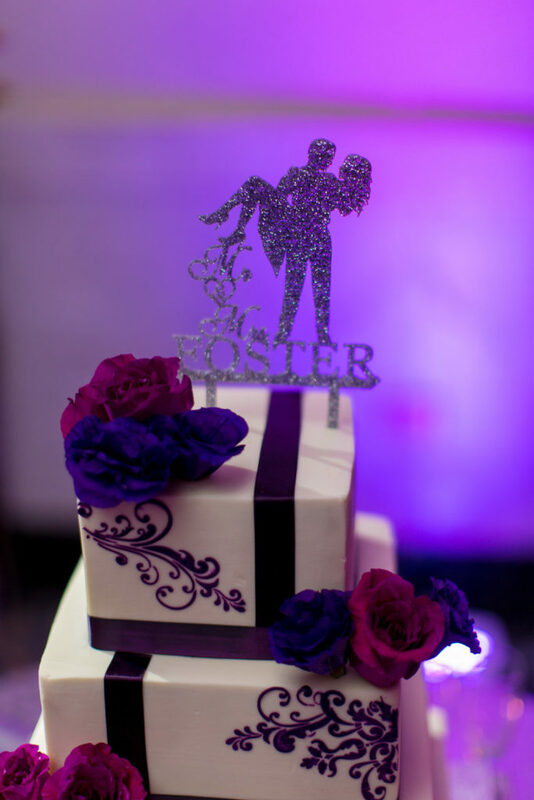 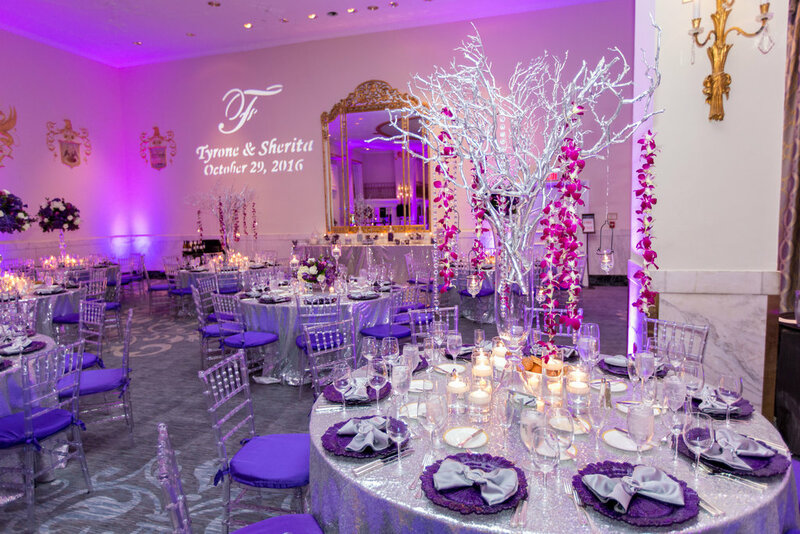 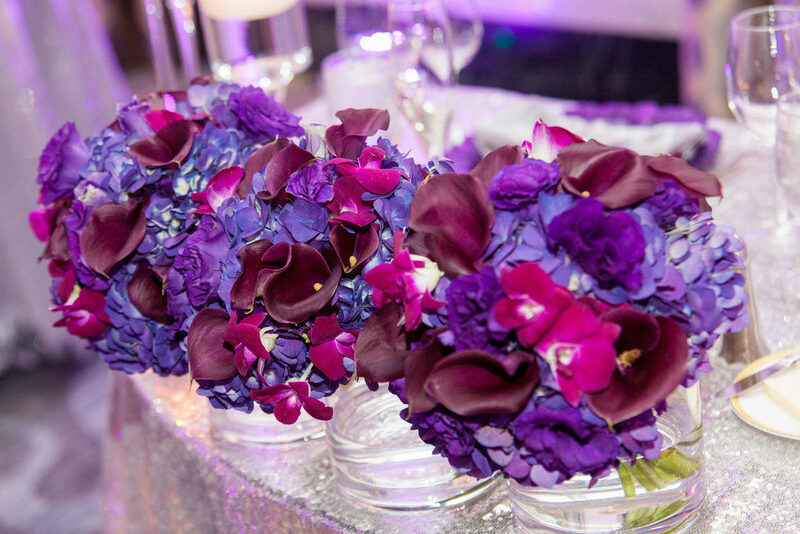 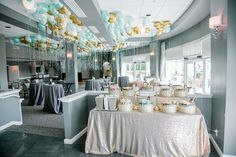 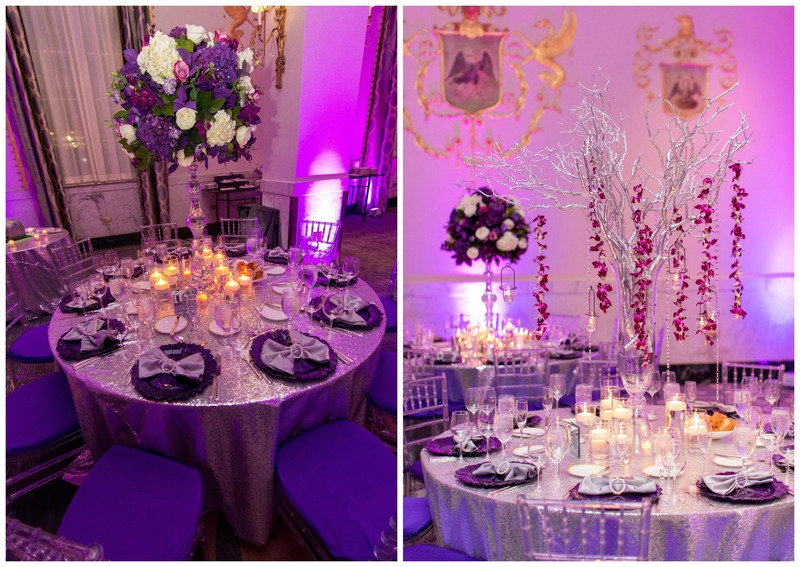 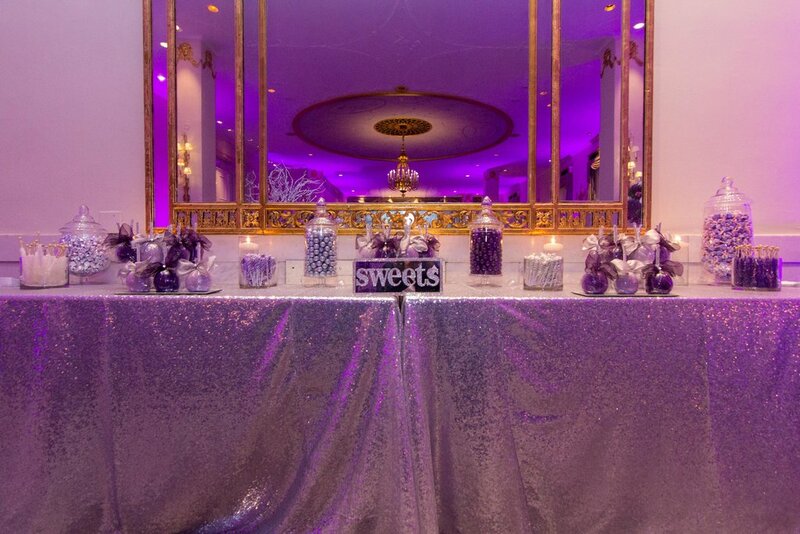 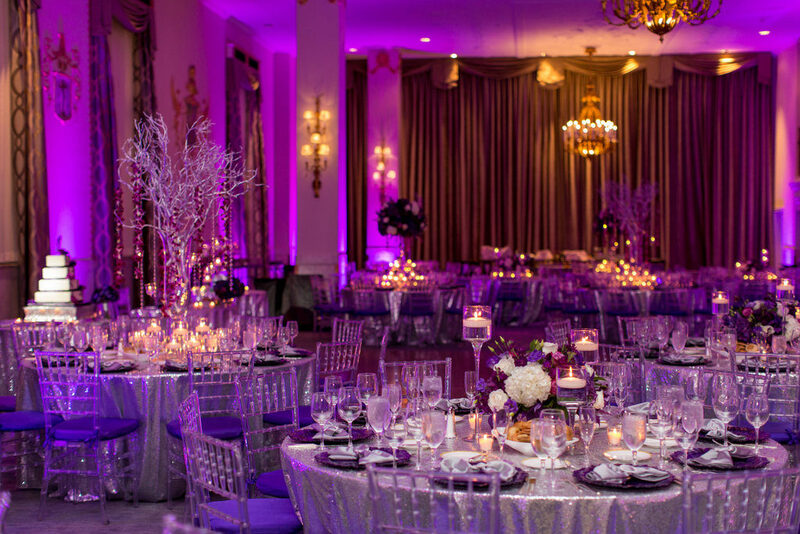 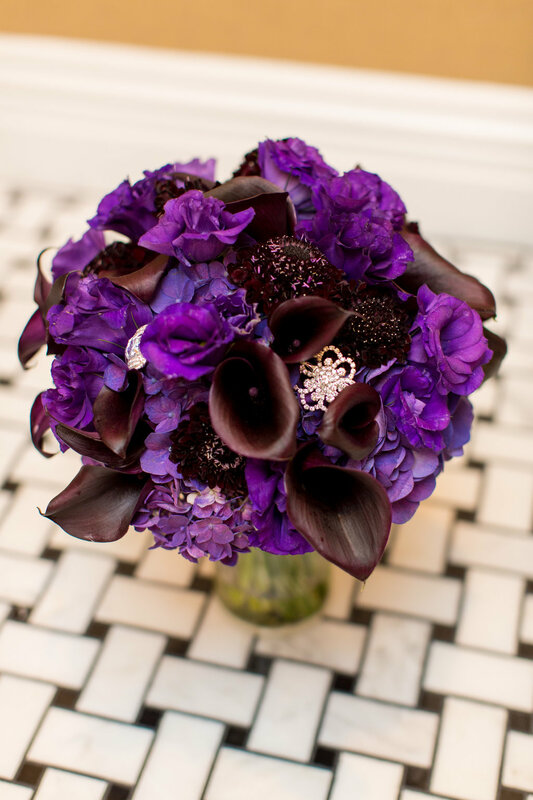 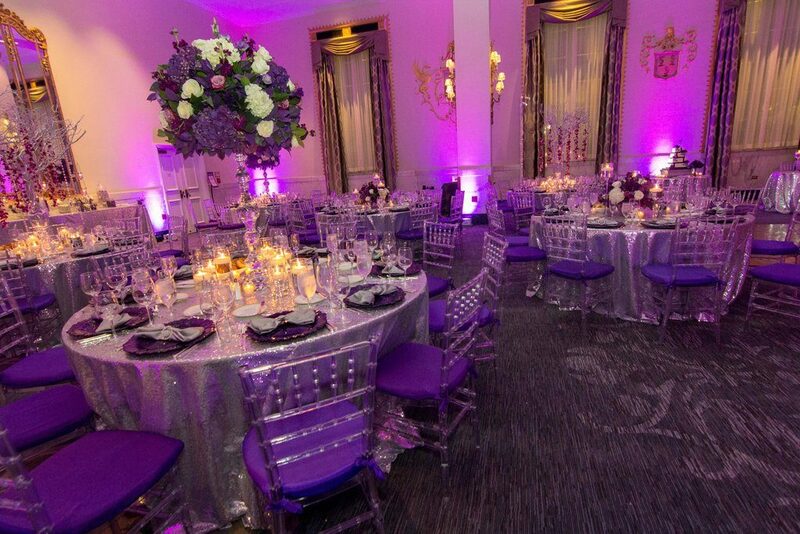 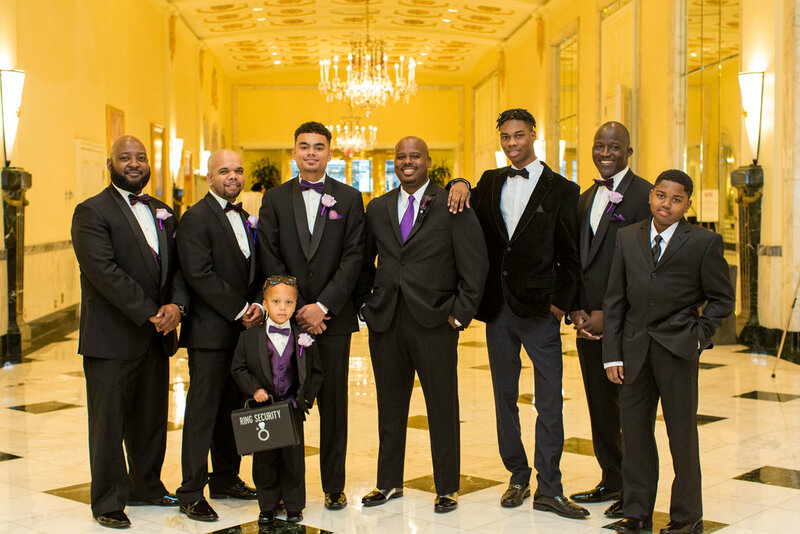 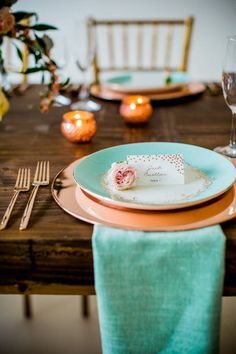 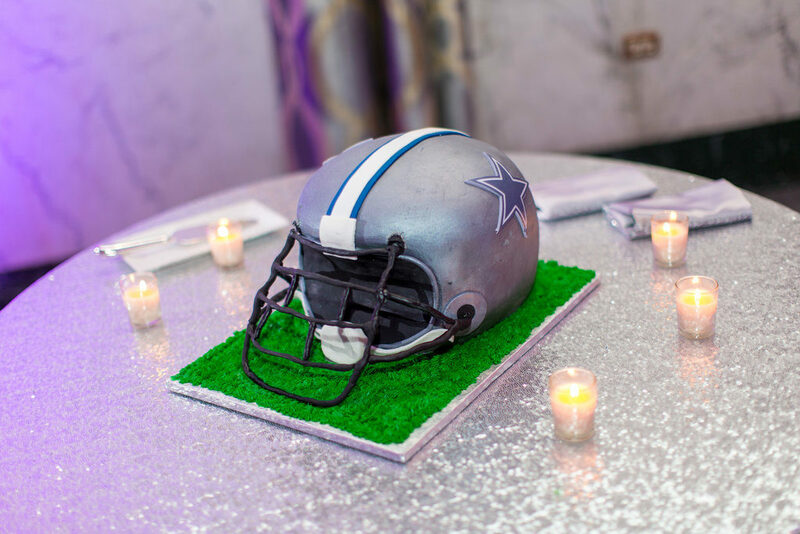 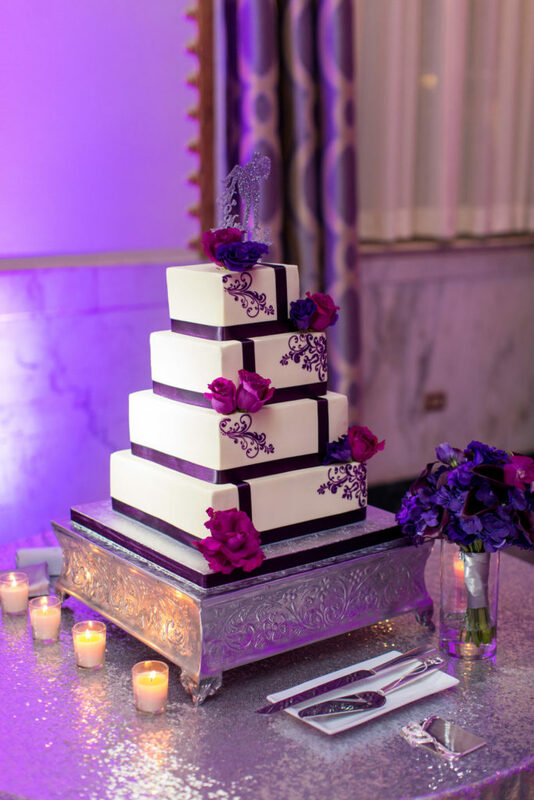 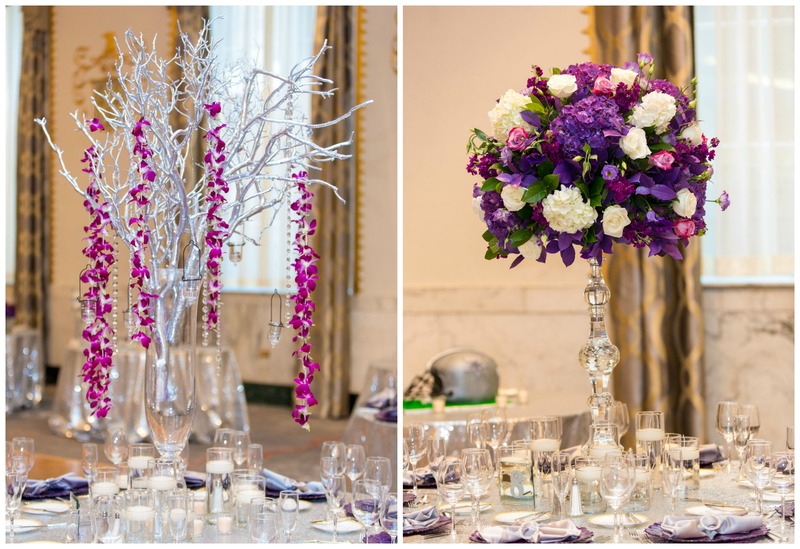 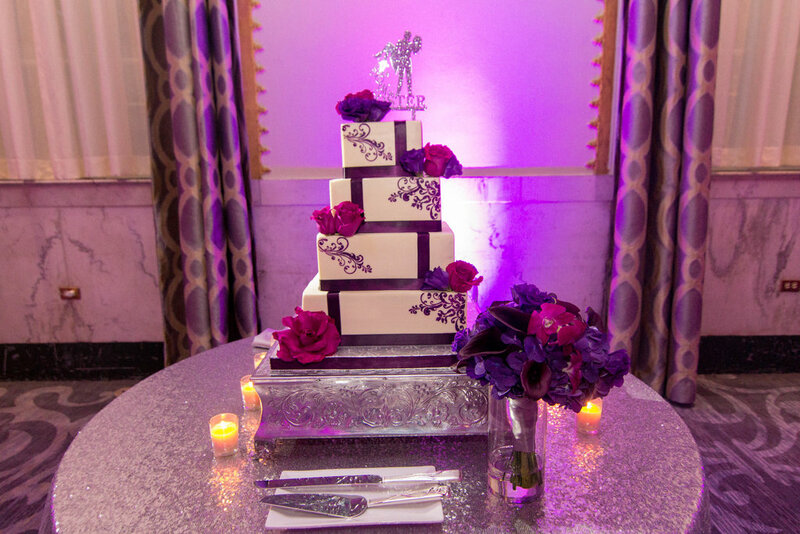 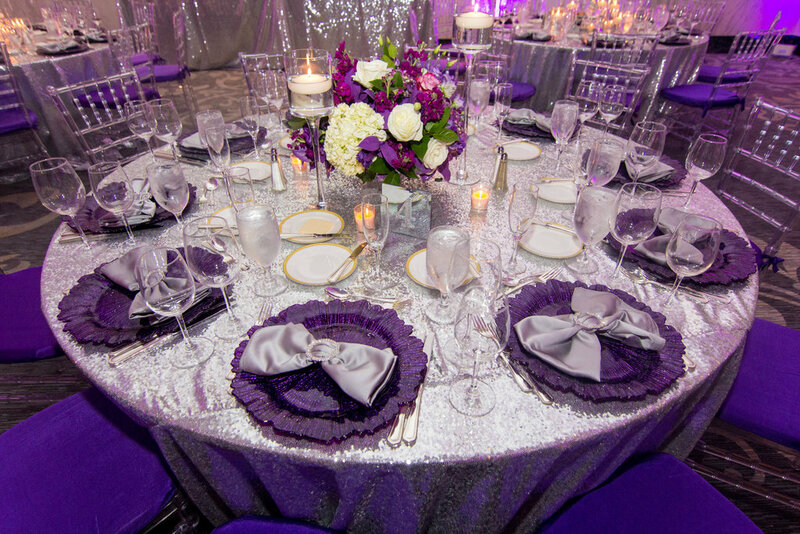 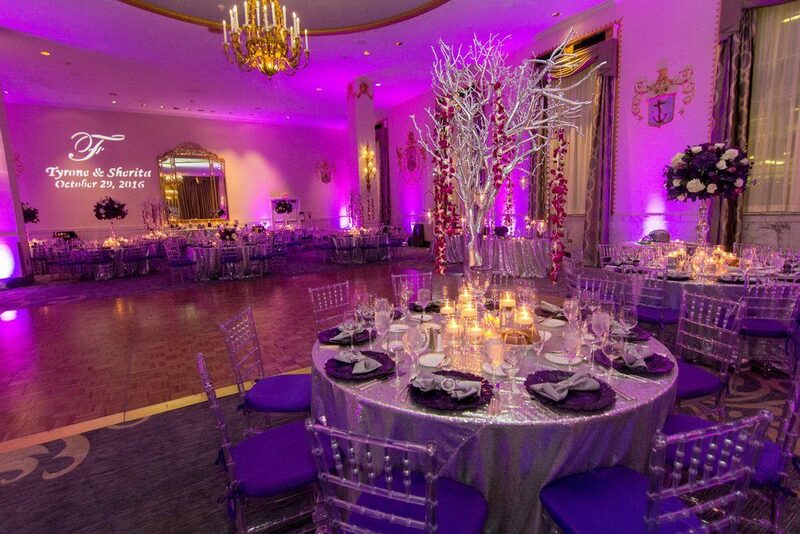 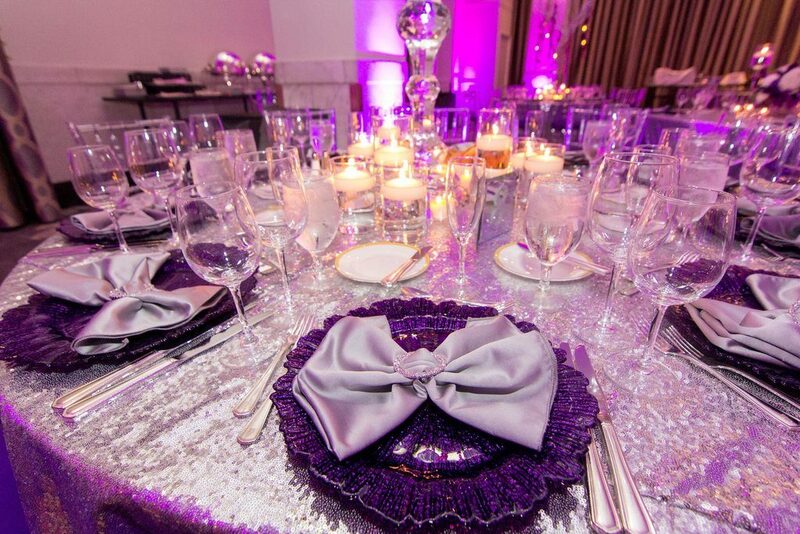 Since purple is the bride’s favorite color, she wore the vibrant color to all of the wedding planning related meeting and there was even a purple and silver décor that included a purple and silver candy bar.